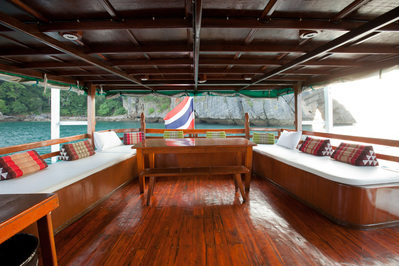 ​.........enjoying a cruise in the islands around Phuket! We have two boats, Merdeka 1 (85 feet) or Merdeka 3 (100 feet) – both have plenty of space to chill out and relax in our selection of Private and Join-in Cruises! ​Private Charter for your friends and family - get a group together for our Bestseller Weekend Party Cruise! ​Company Events / Cruises for that special MICE trip - we do unforgettable, AWESOME Parties! Special Prices from 6,200 Baht per person per Day / Night including full board and lodge, use of the boat facilities and daily tours!